Seven Rivers Barbecue is the eponymous creation of Seven Rivers. Yes, he gave his name to his food cart, a mix of the conventional and the unconventional. The conventional is that Seven cooks and sells fine barbecue. Seven will tell you he makes brisket primarily, but the ribs are to die for. It’s hard to say where the unconventional starts. There’s the location. The historical location of the barbecue is at 5527½ N.E. 34th Ave., behind Tuan’s service station. There are no other food carts on the street, or within blocks. No tables outside. You can leave home without your American Express card because the cart takes just cash. The proper name of the place is Seven Rivers Catering and BBQ. That’s more like it. The place on 34th, for example, doesn’t include potato salad as a side dish – too much risk of food poisoning from mayonnaise. Potato salad with a catered order is great. For the conventional, flags and banners wave during business hours. Signs are up and down the sidewalks. Seven Rivers’ real name is Seven Rivers. He was born on the seventh day of the seventh month of the seventh decade of the 20th century. His father was Ocie Rivers. His uncle was Alfred Rivers, lead singer of the Ink Spots, the pop vocal group that gained fame in the 1930s and ‘40s. Seven’s basketball claim is David Rivers, who played for Notre Dame and briefly for the Los Angeles Lakers. Seven Rivers was born and raised about a half mile down the street. Seven Rivers isn’t just in Concordia. For more than 10 years, he had the barbecue outlet at the Moda Center where he sold Blazer Nachos. After a year off, he soon will start selling wings at Moda events. 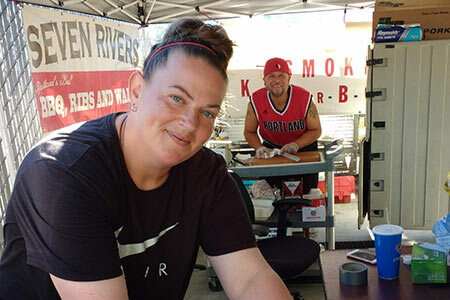 This summer, Seven Rivers Barbecue is at the Cully Farmers Market in the parking lot of Los Pepitos restaurant at 5011 N.E. 42nd Ave. Thursdays from 4 to 8 p.m. in August and 4 to 7 p.m. in September.